By the time I came into possession of this 1976 card of Mickey Rivers bracing for the impact of a falling piano, he had been traded to the Yankees along with Ed Figueroa in exchange for Bobby Bonds. I guess you could say that the falling piano was the fate of continuing to toil with the Angels. Mickey Rivers darted away and let Bobby Bonds take the hit. Rivers lasted three and a half seasons with the Yankees, and in each of his three full seasons the Yankees played in the World Series, winning it in 1977 and 1978. Rivers got plenty of credit for that run, in part because of a lack of understanding in the baseball world at that time that the most important element in scoring runs is getting on base. Rivers was considered the dynamic catalyst of the Yankees’ offensive attack because he generally produced a high batting average and stole bases. However, despite batting at the top of one of the better lineups in the league, Rivers never topped 100 runs scored for a season for the Yankees (and in two of his three seasons he didn’t even get close), an outgrowth of his inability or perhaps unwillingness to draw walks. The sportswriters of the day didn’t notice this deficiency, voting him third in league MVP balloting in 1976, eleventh in 1977, and (most incredibly of all, considering his .265 batting average and .302 on-base percentage that year, numbers that were inferior that season to those of, for example, Duane Kuiper, Bob Bailor, and Mario Guerrero) twenty-fifth in 1978. The other night ESPN Classic replayed the game that got Rivers and the Yankees to the first of the three straight World Series: the fifth game of the 1976 American League championship series with the Royals. Before the famed riot-sparking home run by Chris Chambliss in the bottom of the ninth, Rivers keyed an early rally by slapping a base hit into centerfield. I’d forgotten how unusual Rivers looked and moved. “What’s wrong with him?” my wife asked. We were watching him strut-limp back to first after rounding the bag. He seemed like he’d been assembled in a rush from spare parts, long bow legs springing from a tiny torso, a weird jaunty lean to his body, as if he was suffering from a running cramp. His mouth was motoring. “He’s a character,” was all I could say to my wife by way of explanation. A couple of book notes: Thanks to Steve Buckley of the Boston Herald for featuring Cardboard Gods in his celebration of some recent baseball books. Thanks to Deadspin for posting an excerpt of the book yesterday. Also: the book is now available for Kindle and the iPad. An audio version of the book should also be available now (I haven’t gotten my copy yet, but the page for it is up on Amazon). 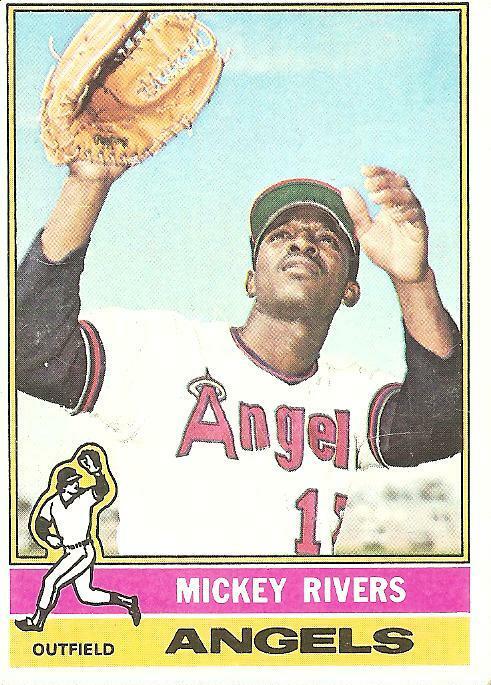 You are currently browsing the archives for the Mickey Rivers category.